I'm happy to announce that Tess now has enough chicken nugget meat on her drumsticks to hold up her BabyLegs tights (they're kind of like baby leg warmers). 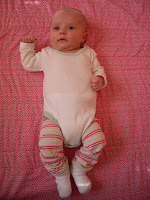 I tried them on her when she was first born, and they slid right off! I love how they show off her shapely baby gams. 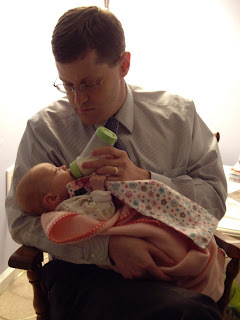 And a couple pics of Tess with her dad. Ry is really good with her. He's even become the master burper (meaning he's good at burping Tess, not burping himself, although he's good at that, too). Tess's favorite place to fall asleep is on Dad's chest, particularly when she's having a rough time (like she was at Nana's house). It comes as no surprise to me, though. I've known how snuggly he is for a long time now! Tess is still very particular when it comes to her hands. For some reason, she gets "fightin' mad" if she can't get to them. 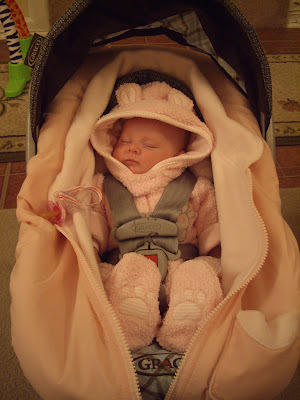 For my shower, someone gave me one of those swaddle blankets that lets you wrap the baby up really tight--straight-jacket style. She was NOT having any of that! 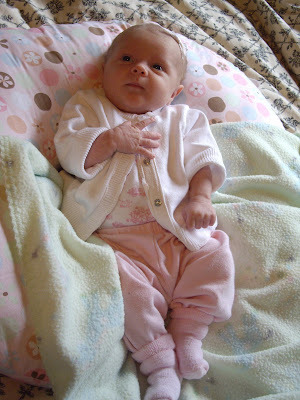 While she's eating, she'll often place her hands on her chest with her fingers interlocked, as if in prayer. She looks very pious--like a content little monk. 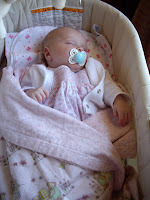 And her fingers frequently serve as good binky substitutes, especially when she's tired or hungry. Tess had her first public debut at church today. 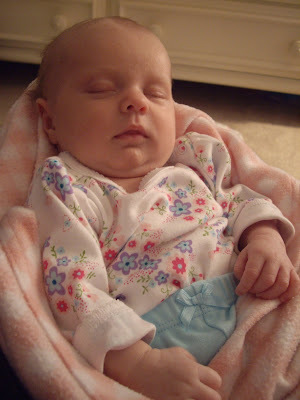 She's six weeks old already, and I think some people at church were a little doubtful about whether I'd really had a baby or not. "Sure, Miriam gains a few pounds, has this supposed baby and then we never see her again. Sounds like a ploy to get out of her Primary calling to me." 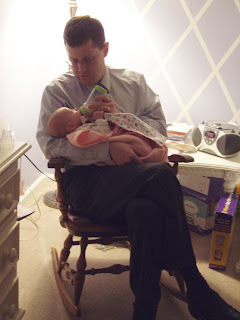 Anyway, we took her to Sacrament Meeting and then Ry took her home for the last 2 hrs. so I could focus on Primary. Paranoid mom that I am, I just don't want her around all the Primary germs. Plus, I'm not sure how well she would fare for a full 3 hrs. at church. She did fine in Sacrament Meeting; promptly fell asleep and snoozed through the whole mtg (I was jealous!). It was fun to see everyone again and show off baby girl. These other pics are from over the weekend. Dad took some pics of Tess playing with her Glo-E bear that Isaac gave her for Christmas. 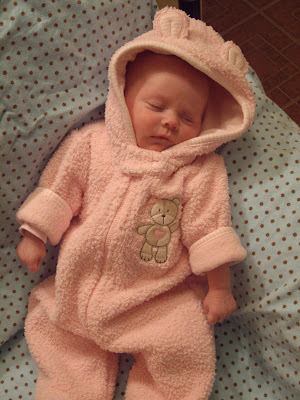 A few more pics to show Nana that we're keeping Tess warm in sleeper suits. The last pic is of Tess after her bath in a towel that was a gift from someone in our ward. 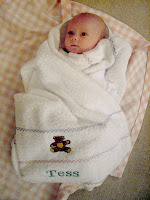 I got some of the neatest baby gifts for Tess--I love the towel with her name embroidered on it. Baby girl has been making real strides these past few days. The past couple nights, she's slept for 5 hours IN A ROW! And last night she slept for SIX consecutive hours! 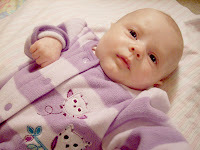 Of course, that doesn't mean that Ry and I did--we kept waking up worrying that there must be something wrong with baby if she's slept for 6 straight hours. Tess had a pediatrician's visit yesterday and everything checked out well. She now weighs 9 lbs, 14 oz and is 21 1/4 inches long! 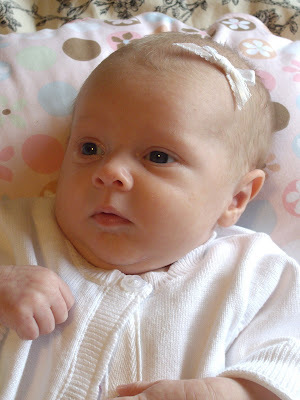 She was in the 30% percentile at birth, and now she's in the 75% percentile! She's gained almost 4 lbs from her lowest weight and grown 2 inches! She also had to have an immunization shot, which she wasn't too pleased about. Boy, did she scream! I thought I'd let her tell you about the harrowing experience. I haven't told her that we have to go back in a few weeks for a whole round of shots. 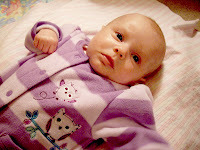 These last pics are for Nana, who has been very concerned that we aren't keeping the baby warm enough. 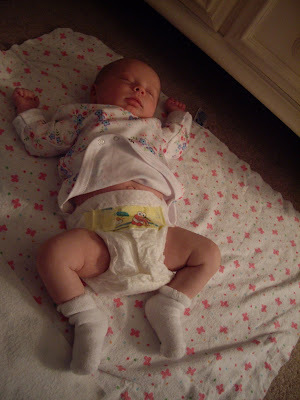 When we were at Nana's house, we'd catch her sneaking into the baby's room to pile blankets on Tess at night. Don't worry, Nana. We won't let the baby freeze! 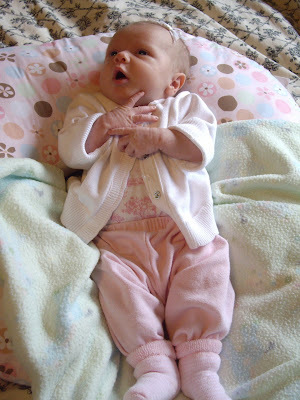 In the interest of full disclosure, here are some more of Ry's baby pics. So what do you think? Does Tess favor her mom or her dad? Cast your vote! Now that baby is doing better, we're settling back in at home. Ry had work off yesterday, so it was nice to have his help to get things organized. 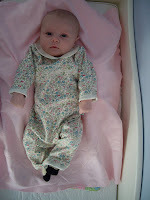 Tess spent some happy time in her bassinet today. 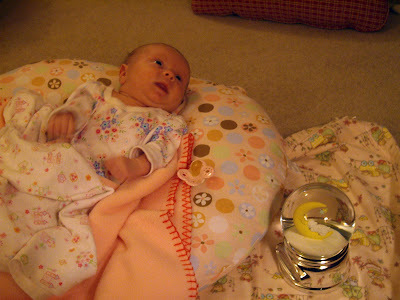 She is starting to see and focus in on objects, so we thought she'd like to try out the mobile above her bassinet. 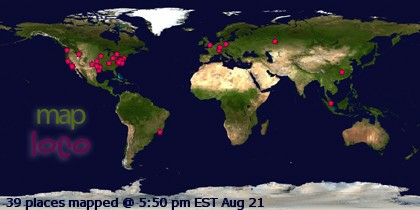 These other pics are from about a week ago. They fulfill Reen's request for a pic of Tess beside me, a pic of Tess's feet, and a pic of her "chicken mcnugget" thighs. 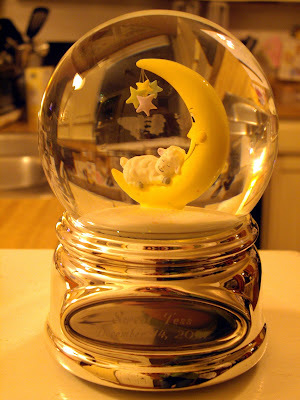 These last pics are of Tess enjoying a beautiful musical snowglobe that was a gift from her great-grandparents. It is inscribed "Sweet Tess" and it describes her perfectly! How lucky she is to have so many people who love her! Here are some pics of me as a baby--these should help inform your vote. For the first time in days, we actually have hope that baby is feeling better. Last night before bed she actually had 2 hours of awake time, during which she was not constantly screaming and miserable. This morning has been really good, too. She's been awake and back to her sweet, happy self. These pictures are mainly for her Dipsy, who's been keeping constant vigil over baby's well-being from clear across the country. Tess loves her Grandma Dip. The verdict now is that Tess looks more like me than she does her Dad. I think she's a pretty good blend of us both, but I can't deny that her round face and chunky cheeks look a lot like my baby pictures. Maybe Mom can send pics of some of my baby photos and we'll compare.